- Slightly farther from center when selecting [Left] or [Right] alignments compared to previous version. - Added genre differentiation when selecting [Left] or [Right] alignments. As male character, the camera will get slightly farther from center compared to female characters when selecting alignment. This is to help when using a bow and the arm obstructs your aim. You will have to reselect [Left] or [Right] to apply this change. - Changed the power's text description to a more immersive one. - Added a note on Alignment page about Proper Aiming and offset aiming. Provides different third person camera views for melee and ranged while also allowing customization. How to customize the camera: you receive a spell power named "Power of Self Vision" when you load your game, cast it to bring up the settings UI. Be sure to use Proper Aiming mod in order to fix the offset aiming. For PC users: SKSE will be a soft requirement later when it will be available and be able to fix certain issues which are mentioned below in Known Issues. (!) 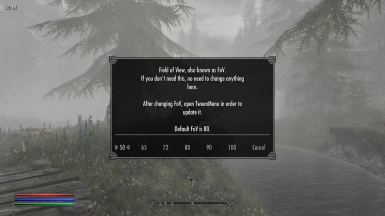 Disclaimer: Do not consider this a port of Customizable Camera from the old Skyrim, neither its successor. 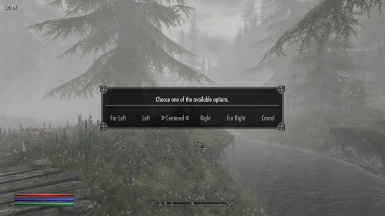 - Gives you a spell power which brings up customization options. - Provides individual camera views for Melee and Ranged. Now you can have Centered melee combat and Over The Shoulder archery. - You can customize: Idle, Melee, Ranged, Min/Max Zooming, FoV. - Doesn't provide the extra features from Customizable Camera such as: Swap Side Camera, View Mode or Adaptive Sneaking. Those features absolutely requires SKSE which is not available yet. - Doesn't provide saving and loading profiles in external files. This requires SKSE and PapyrusUtil. - Doesn't force the game in First or Third person. Just mentioning this in case you can't switch between First or Third person views. This mod doesn't has the code to do this. - Compatible with any mod that doesn't change camera. 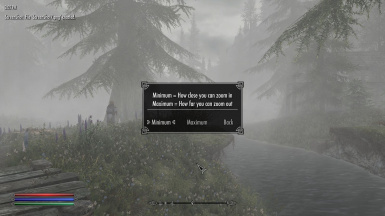 - Compatible with Proper Aiming and that mod is also recommended. - Sometimes Ranged weapons uses Melee camera settings, this is because camera only updates when you draw and sheath weapons. SKSE might fix this. 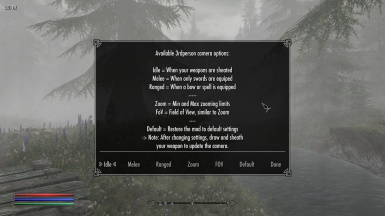 - Changing from Ranged to Hand to Hand doesn't update camera to use Melee camera and instead, stays in Ranged camera. This fixes itself after changing your stance. SKSE might fix this. - Sometimes the camera randomly changes in a weird manner. No idea why this happens, I assume the game randomly updates camera in a stupid way. This also happens with Fallout 4 from my experience.